It is the vision of my district (and the others who are members of the Maine Cohort for Customized Learning) to expertly prepare every child for a future yet to be imagined. We look to achieve this by restructuring our schools for Customized Learning. At the root of Customized Learning are two core principles: that students learn in different timeframes and that students learn in different ways. We believe that many of our challenges with student achievement are based on the fact that our current school structure does not widely support these two principles. Through our reform work, we will strive to make learning the constant and time the variable, instead of trying to struggle for student academic success in our current school structures where time is the constant, resulting in learning being the variable. Our vision has students working their way through a well-defined continuum of learning, using their passions to create a path and choose how they will demonstrate their understanding of the learning. While teachers will still do targeted direct instruction and plan rich, interesting (standards-based) units of study, these are delivered when students need them (and we have the tools, so teachers will know!). Good Customized Learning takes skilled guidance, direction, and coaching from thoughtful teachers, who will place emphasis also on assessing frequently, providing timely formative feedback, coaching, motivating and nudging, monitoring progress, identifying learning resources and multiple pathways to demonstrating mastery, as well as timely direct instruction. Teachers and students will work together to match student interests, strengths, and learning preferences to opportunities to learn. Ultimately, all students will be successful with our career- and college- ready curriculum, and teachers will be successful in creating learners who are well prepared to go wherever they want with their futures. As educators, we work in a vocation that, for over a hundred years, has been geared toward the preparation of youth for the Industrial Age. Yet, today, we are acutely aware that we need to prepare students for the Information Age. Where in the Industrial Age, school appropriately developed the talents of a few and the compliance of the many, school today needs to apply a different tact for the Information Age. We need to develop everyone's talent. This entry was posted in Customized Learning, Shared Vision on January 6, 2013 by Mike Muir. If you are reading this, I suspect you want to help move your school or district forward, and recognize that a critical first step is developing a shared vision with stakeholders, including your staff and community. This is the third post describing a process to quickly build an effective vision. The first post set up the activity. 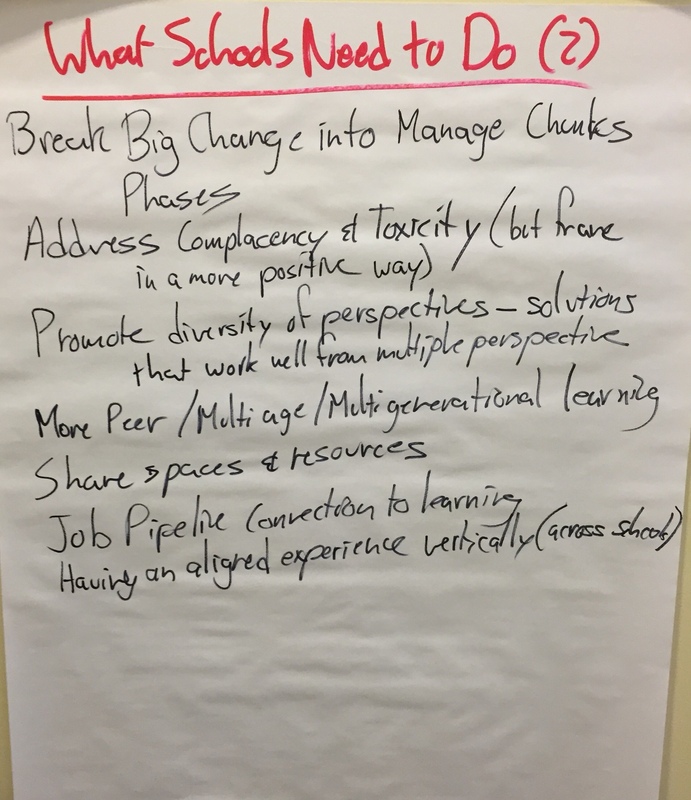 The second post described how to collaboratively envision a preferred future for students you care about. This post will describe the final step in the process, developing a plan for preparing students for that preferred future. Without a plan, the vision created in the futuring phase will remain at best a dream. The worse outcome would be that it would not be used to improve teaching and learning. 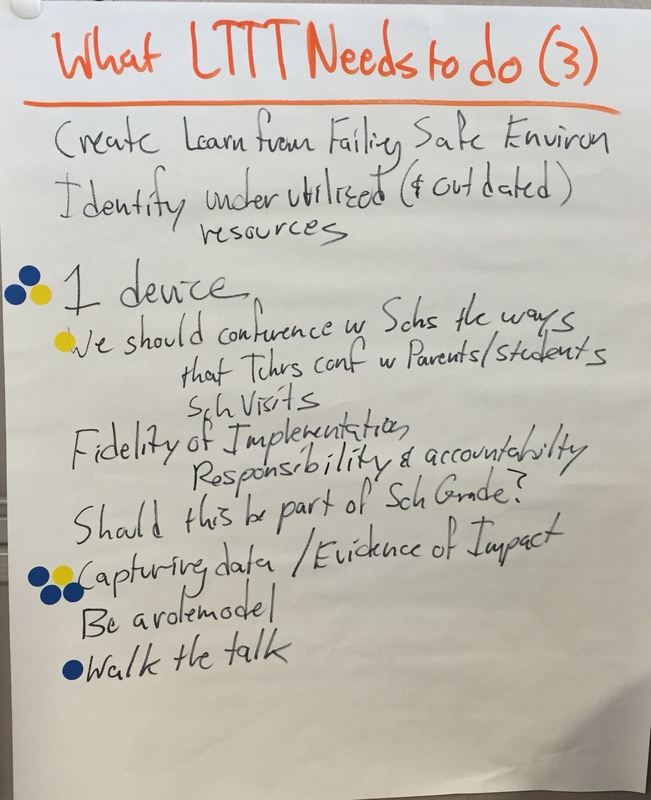 In short, given a clear view of what this stakeholder group wants the future to hold for their students, it is now time to use that vision to help design the kind of schools, school community, and classroom practices that can be reasonably expected to deliver those desired outcomes. If this is our preferred future for our students, what do students, teachers, administrators, and tech coordinators need to do now to prepare students for that future? By accepting that student practice has to be the center of the target, and given the vision created in the last post, ask participants what a student would be doing in the classroom today if they were going to be “on track” for becoming the learner they have envisioned. Have a new chart paper sheet labeled “Student.” The prompt is, “If this is what we want for our students' futures, what does the student need to be doing now to get ready?” Record everything that they call out. Once the student practices have been described (which you can expect to focus on inquiry, self-directed learning, teaming, research rather than memorization, growing as a learner, etc.) the participants will be ready to think about the kinds of changes in student practice we need in our classrooms. This is an interesting process. 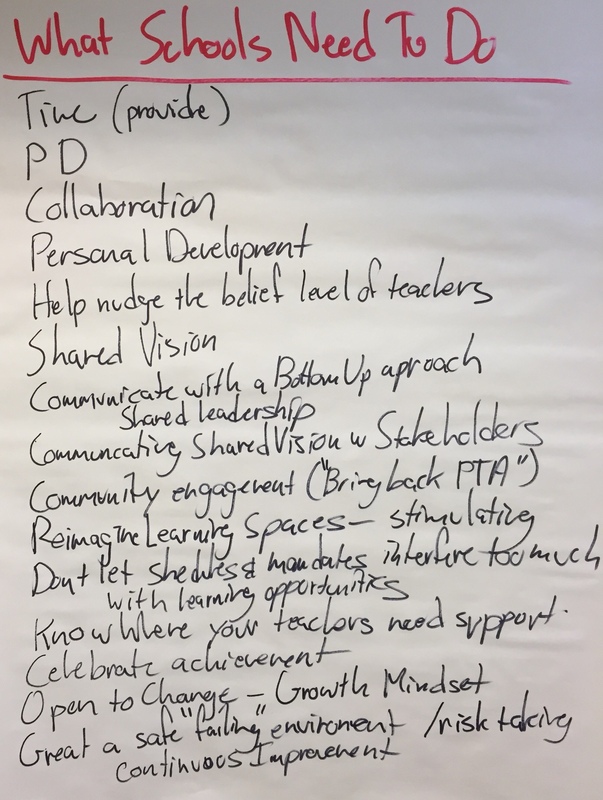 If you start here with student practice, you get a list of preparatory activities that really does reflect the future you have described, but it also suggests how teacher practice needs to change. But not following these steps can derail the process and not give you the information you need. 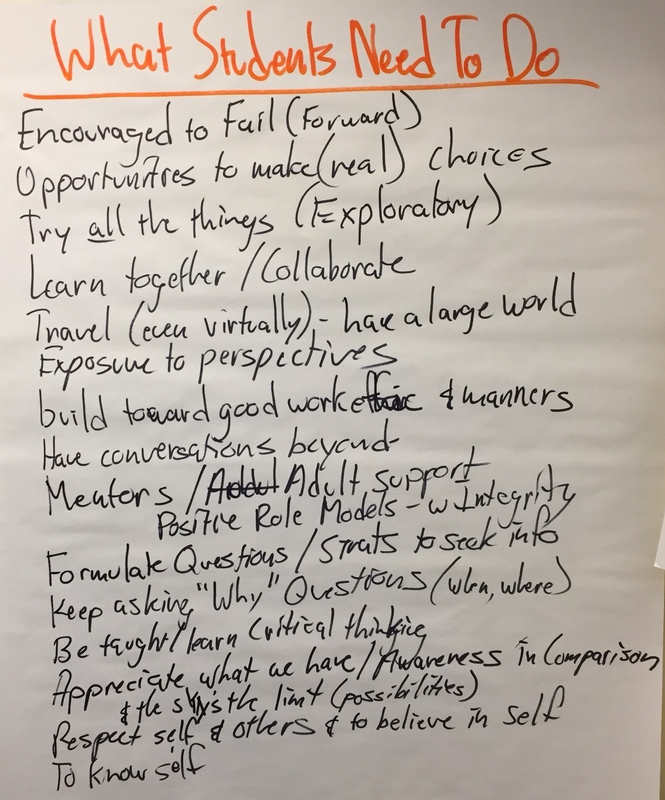 I once worked with a group that ended up skipping the step of starting with what students need to be doing now to get ready for this future, and instead simply asked what needs to happen in the classroom to prepare for this future. This group happened to be all teachers, not a larger stakeholders group. 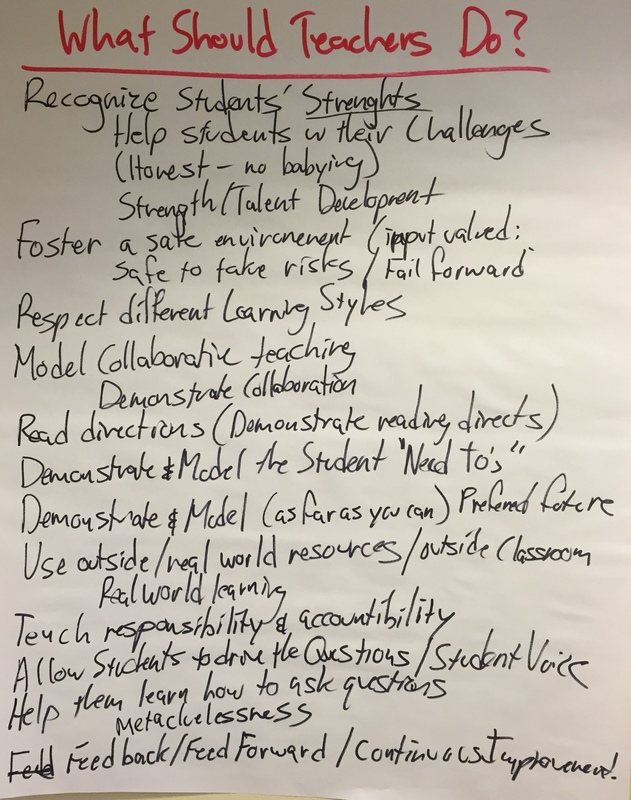 Interestingly, they simply generated a list of traditional teaching practices and “shoulds” for students (They should do their homework. They should behave. Etc.). I think a couple things happened. One was a little bit of paradigm paralysis. 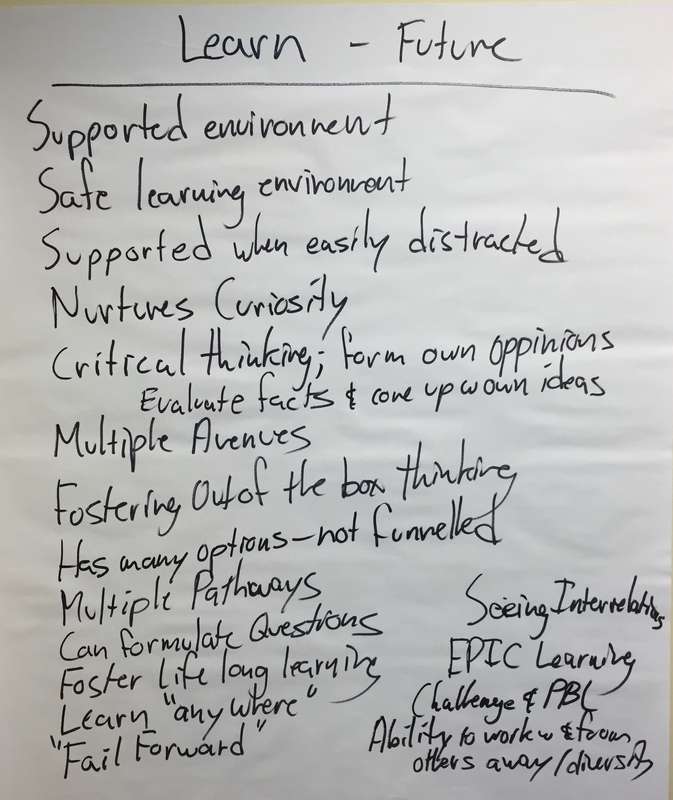 When we asked what should happen in the classroom, we thought right away about what we were used to doing in the classroom. And this was exasperated by the fact that the notion of what should happen in the classroom is just that much further removed from that preferred future than the notion of what a student should be doing now to get ready (the preferred future, after all, is about students, not classrooms). The combination of paradigm paralysis and being further removed from our preferred future kept us from coming up with a plan that was likely to get us to that future. So the lesson is: starting with student practice is critical. 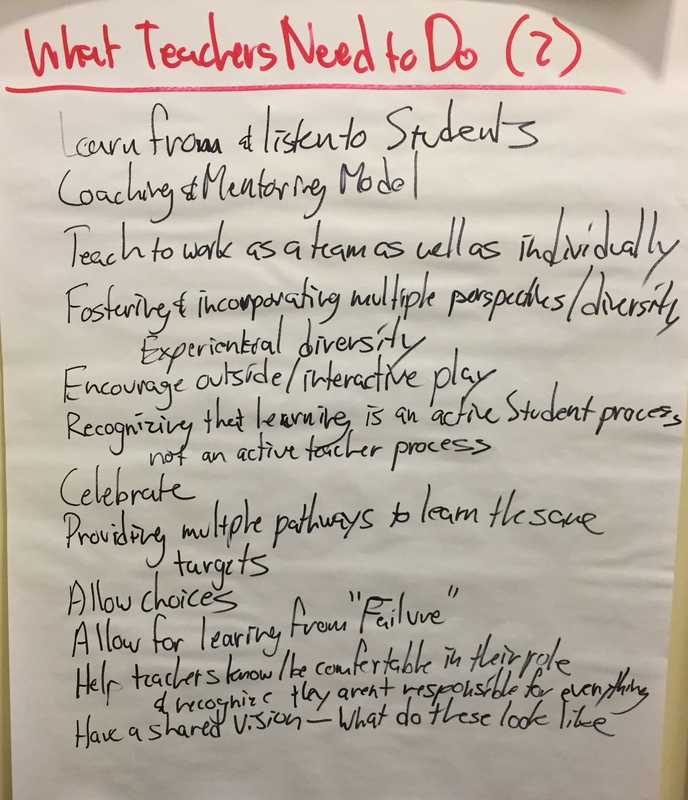 Once the student practices have been described, ask participants to envision a classroom of today where those student practices were a reality, and describe what the teacher would be doing. In this way, they will define the “teacher practices” that would effectively support the visioned student practices. Add another chart paper sheet labeled “Teacher” and ask the group, “If this is what the students need to be doing to get ready, what do the teachers need to do?” Record what they call out. With teacher practices defined, ask participants to move out another level to describe the Principal and Tech Coordinator actions that would be seen if one were to visit a school in which the visioned student practices were happening. It will also be important to describe central office administrative practices that would support the now-visioned building Principal and Tech Coordinator practices. Add a last chart paper sheet labeled “Administration & Support” (or maybe separate sheets for each subgroup) and ask the group, “If this is what the students and teachers need to be doing to get ready, what do the administrators, assistants, curriculum coordinators, tech directors, and other support teams need to do?” Record everything that they call out. Your stakeholder group should now be congratulated! By working outwards from the student, a clear focus throughout will be maintained on the students and their practices, and all other efforts would be in support of those changes. You now have a draft vision that can be used to drive your work, including decisions about resource selection and allocation, the use of technology, and professional development. There are still a couple steps. What was generated on chart paper should be typed up and the language cleaned up a little and made clearer. The two part vision document (the preferred future and the plan) are now ready to be shared with the wider school community, including those who were not part of the stakeholder group that created it. You might even go through a process of collecting feedback from those who weren't at the event and then seek formal approval of the vision from the educators, and then from the community. Creating a shared vision is a critical step in school improvement efforts. This post is the continuation of an effective process for creating such a shared vision. In the previous post, we discussed the background of the process, who to invite, and some of the set up. This portion focuses on how to arrive at the preferred future we have for students we care about. The next post will highligh the last steps in the process. You'll like this process for the same reasons I like it: it is quick and dirty, and gets to the crux of what we want for students. You've welcomed the attendees and gotten them seated at their tables. The first step in the work (after introductions at tables), is to ask participants to think of a student they care about. Participants should be directed to think of the students “as their own children.” This is considered a critical component to insure that during this visioning process they do not get “mired in current reality” (get too frustrated thinking about the students who frustrate them! ), but rather allow and encourage them to “vision the best” for students they care as much about as they do their own children. Where Will They Be In the Future? Next ask them to think into the future for that student – through middle school, high school, college/military/training, to a time when they are living and working on their own. 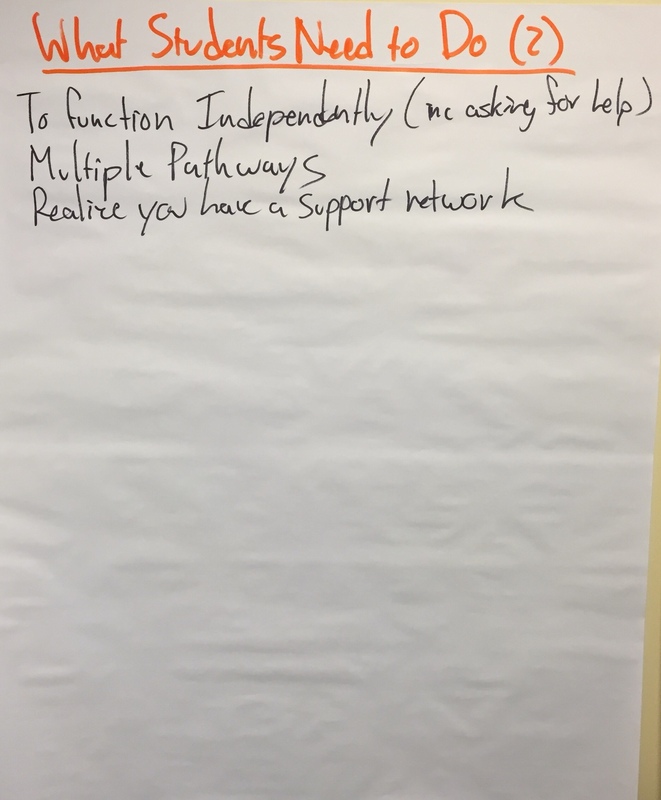 Have individuals (independently) record their own responses (you might provide each table with scratch paper, or a handout with boxes for each of these three domains, where participants can jot their thoughts). Next, have each table compile their answers. The table groups can then reconvene as a whole group to share their Where Will They Be? lists. The facilitator can have three chart paper sheets—one labeled “Physical Location,” one labeled “Learning Location,” and one “Working Location,” and list everything that tables report out. Have groups report out on only one of these three domains at a time. Perhaps use a Round Robin approach, where each group only shares one item on their list, then the next group shares one, and so on. Groups are asked to avoid repeats, and the facilitator keeps going around until all items have been shared and recorded. Repeat similarly for each of the other two domains. Occasionally, while asking “where will the be?”, someone will suggest something like “Walmart” or “in jail.” It's usually good for a laugh from the group, and clearly they are focusing too much on the students they don't know what to do with. But these kinds of comments can start to lead the group down a very negative path. It is prudent to ask the group, “Is this really our preferred future for students we care about?” This will get the group back on track to creating a desirable vision. Below are some of the common responses I have received from various groups. What Kinds of Jobs Will Students Have? What Will Their Learning Look Like in the Future? 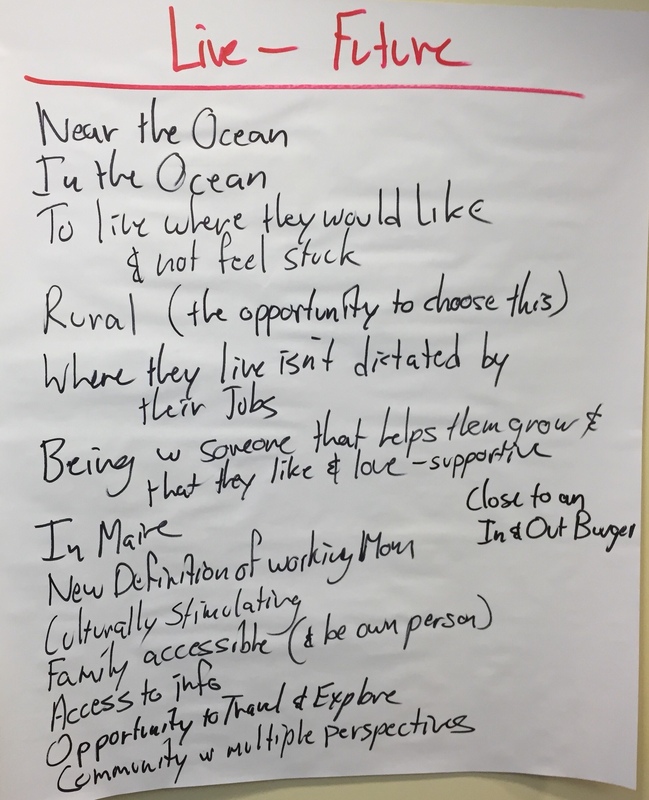 I have shared these lists to give you a sampling of the kinds of preferred future groups might envision. But don't make the mistake of trying to build a vision around these here (or any other list belonging to someone else). Your list only gains its value if it is your own. You need to ask the questions of your own stakeholder group. But once you have your own lists of where the students will be in the future, let your participants know that this is their preferred future. This is what they want for the students they really care about. And remind participants that if this is what we want for the students' future, then we need to start preparing them for it now. 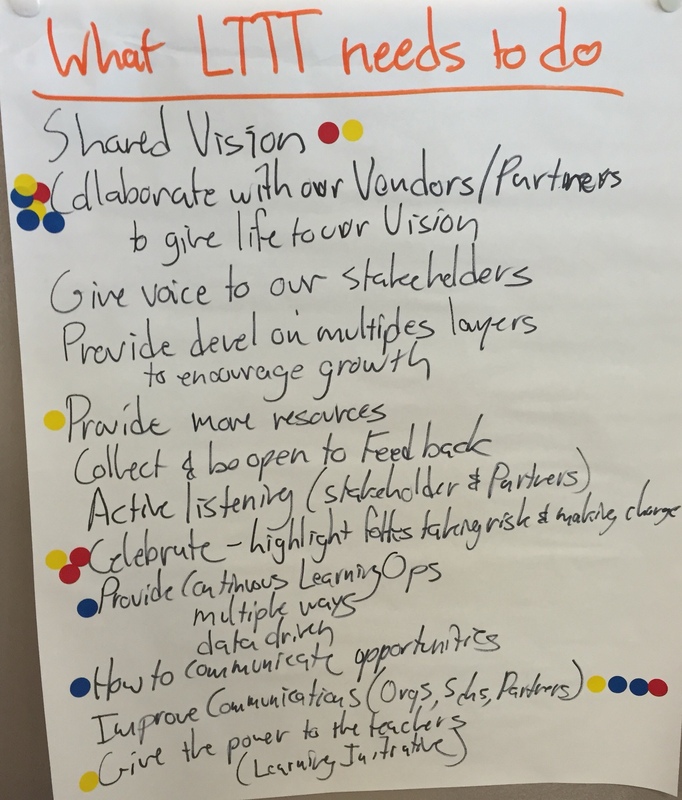 This entry was posted in Leadership, Shared Vision and tagged Leadership on August 8, 2012 by Mike Muir. We can answer those questions if we work with our staff, students, families, and community to create a shared vision. A vision tells us what our desire outcome is and a shared vision has a lot of buy-in, because a large cross section of people connected to the school were involved in creating it. This post describes the beginning of a process I like enormously. I like it because it is quick and dirty: it can be accomplished in one or two afternoon or evening meetings. And I like it because it gets right to the crux of the matter: what is our preferred future for the children we care about and what do they need to be doing right now so they can get there? This is the same process that was introduced early in the implementation of MLTI. In the spring of 2002, eighteen regional meetings were held around Maine in support of the Maine Learning Technology Initiative (MLTI). Each school sent a shared leadership team (a teacher leader, building principal, and technology coordinator). Hosted by the nine Exploration Schools of the MLTI, these meetings were designed and facilitated by Bette Manchester, Distinguished Educator at the Maine Department of Education, and members of her Design Team for Curriculum and Professional Development (I was involved in a couple of those, and have used this process with diverse groups since). Educators from all of the 239 MLTI schools attended the meetings. 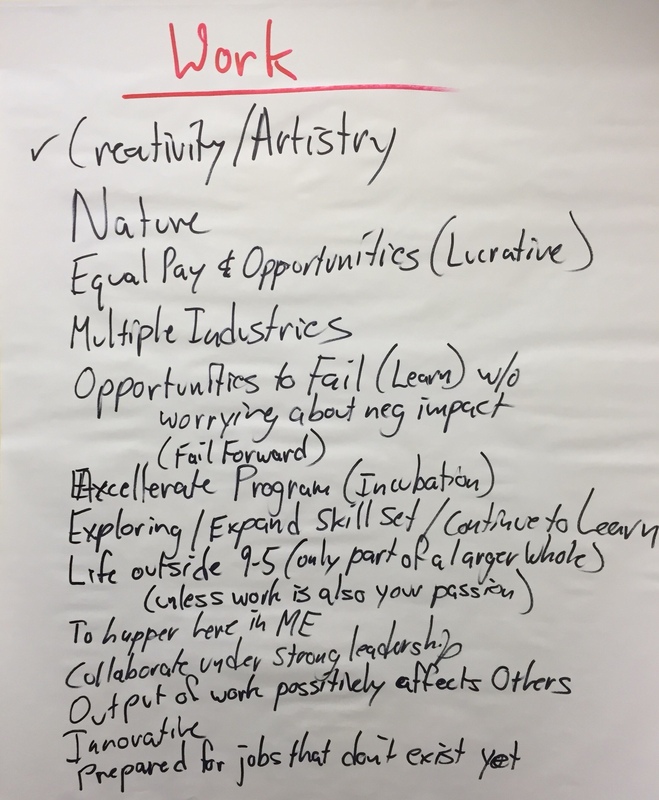 Out of these meetings came both a statewide vision for the future of Maine’s students, including defining the role of technology in that vision, and a replicable process for building a shared visioning back at their own schools. The place to start, of course, is to think about who to invite. It is important to have as many people as you can physically accommodate, and to have as broad a cross section of participants as you can. At a minimum, you should have representatives from administration, the staff, students, parents, and other community members. And don't just invite the historically “supportive” people. A shared vision is a powerful tool precisely because it is shared, because it has broad approval. And when people of all perspectives are represented in that work, it is a very strong document. The process will involve individual, small group, and large group interaction, so I'd recommend a venue with tables for small groups, rather than rows of chairs, or “theater seating.” You will need name tags, individual writing materials (pens or pencils, and scratch paper should be fine), chart paper, masking tape, and markers. You should think about who will be attending and how you might want them grouped. 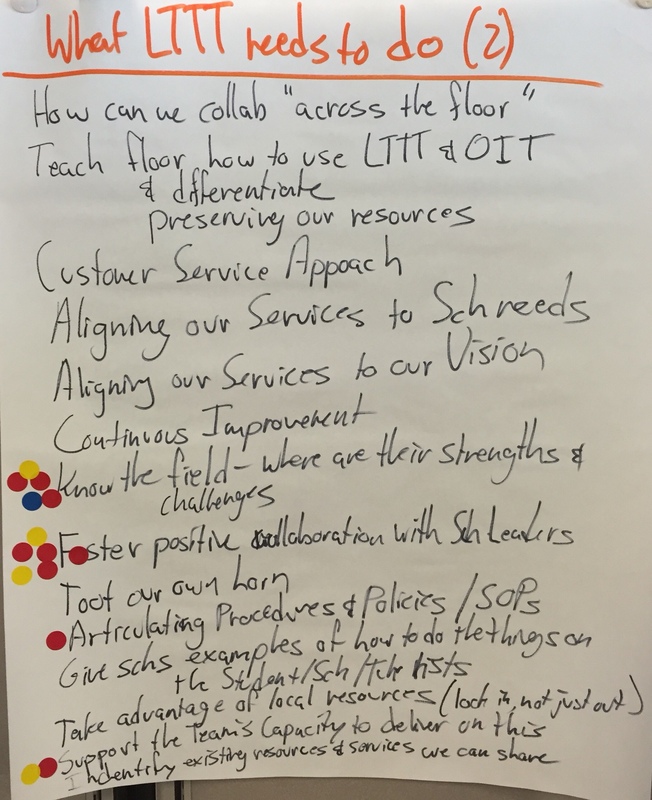 At the MLTI meetings, participants were broken into groups of 6, including complete teams (Teacher Leaders, Principals, & Technology Coordinators) in the same group; we wanted the local shared leadership teams working together.